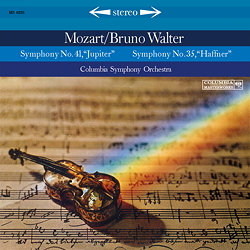 ﻿At flea markets in the colourful, pre-digital era, one could occasionally find Bruno Walter’s Mozart recordings amongst other 'rarities'. Thin vinyl discs of dubious origin changed hands for a small sum, the cheap bootleg recording gave up the ghost after just a few rounds on the turntable and then vanished into thin air. What remained, however, was a musical impression that – from that moment onwards – influenced what one expected when listening to Mozart’s symphonies. Is it the unifying sound with which Walter so harmonically interweaves the slender serenade-like character with the great symphonic idea in the "Haffner" Symphony? Does the magic of the fast finale, which Mozart wanted »to be played as swiftly as possible«, lie in the brisk tempo or in its clear structure? An answer to this and other questions is given by this new release of the Symphonies No. 35 and the unique "Jupiter". The latter was a linchpin in the history of the genre; it not only terminated and consummated Mozart’s creative period but also opened – as the first monumental piece – the way to the great symphonic works of the 19th century. The tightly knit finale in particular, with its sparkling mixture of strict counterpoint and galant style, is highly captivating thanks to its spirited and motivated, yet never overhasty, rendering, which can be enjoyed time and again on this production. And that’s guaranteed!